We jumped ahead two hours today by flying from Las Vegas to New Orleans via Dallas Fort Worth Airport. I didn’t take photos of planes or skies. We were driven to an airport. We flew in a plane. We caught a monorail to a different terminal. We flew in another plane. We were driven to our hotel. We ate and drank in the hotel bar. We watched TV (LA Kings vs NY Rangers in NHL - LA lost 4-2). 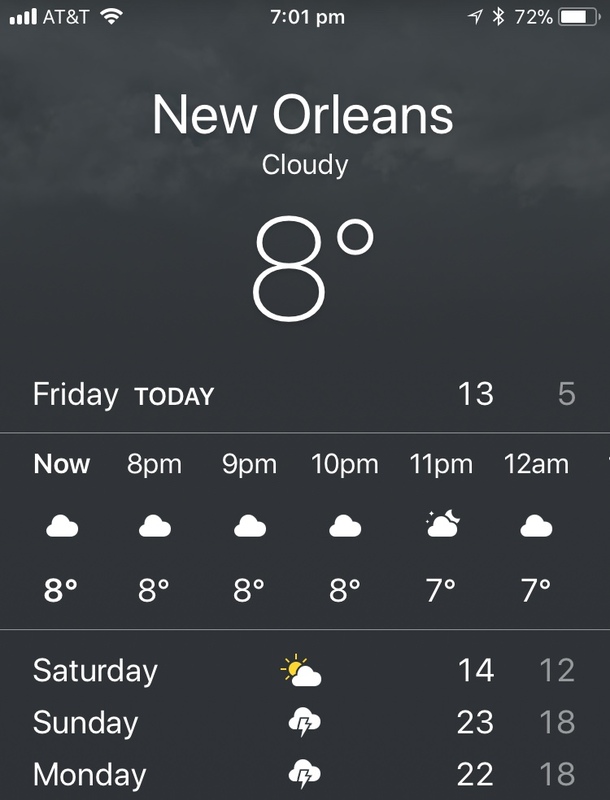 But for something more exciting, here is a screenshot of the weather (in degrees Celsius) for the next few days in New Orleans (we leave Monday). It will be a strange few days. During today’s travels I was reading the latest edition of The Monthly. Don Watson’s clever and acerbic words regarding the government’s handling of dual citizenship and refugees, beautifully illustrated hypocrisy and lack of integrity. It is not quite on the scale of Trump but comparisons can be made. A doctor by trade, Karen Hitchcock is an excellent writer and sometimes reaches into my soul. The way she described the boredom and burden of jobs and the routines of life, took me back to the last couple of years of my teaching. The same old battles occurring day after day become wearisome but then there’s a moment of brightness that sustains you for some time again. I’m not sure if I want to return to schools full-time after uni. I’m looking for a change. Perhaps working at universities is the way I’ll go. Watch this space, I suppose. The last article I read today was by Noel Pearson about the government’s rejection of the Uluru Statement from the Heart. I wasn’t looking forward to reading this one, the way we Australians treat our first people is the way we treat toenail fungus: ignore it as long as we can, hope nobody notices it, finally buy some cream to treat it, don’t apply the cream often enough, but somehow it disappears anyway. I was ready to hear Noel Pearson vent his anger and frustration but instead I felt his hurt and disappointment, in Turnbull, Abbott and every PM since and including Howard. But also in himself. A friend recently asked me how I felt about shifting the date of Australia Day. I’m in favour of it and voted for triplej to shift the Top 100 Countdown accordingly. My friend didn’t agree, on the basis that moving a date to satisfy a small percentage of the population could (and probably would) upset another portion of the population. I didn’t think at the time why this argument didn’t work for me but as I drove home it dawned on me. The indigenous people of Australia are not just a percentage of the population, they are the first people of our nation, they are the most victimised of our nation over time. I have respect for Paul Keating’s Redfern speech, 10 December 1992 (for the Year of Indigenous People in 1993). I’m pleased Kevin Rudd said ‘Sorry’ in 2008. But now we need to put action behind these words before they become hollow in the face of horrific statistics continuing to indicate the mistreatment, poor health and poor education of the maligned indigenous people of Australia. 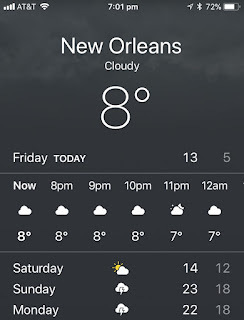 So here I am in New Orleans, a city with a history of a blend of people from a range of different places in the world. Already we have sat in the hotel bar full of middle class white patrons with all the workers around us being not-white, except one. It made me uncomfortable. I feel powerless to change anything here in the US but back home I could be doing more. My business name is Think Learn Act. I think and I learn but I need to act more. I’m just unsure how. I have been an accountant and a teacher and involved in a whole range of activities but I have always been interested in writing. This blog started as a place to post my pieces from completing a Master of Arts (Writing and Literature) but until recently didn't have time to maintain it. I hope to be more frequent now.